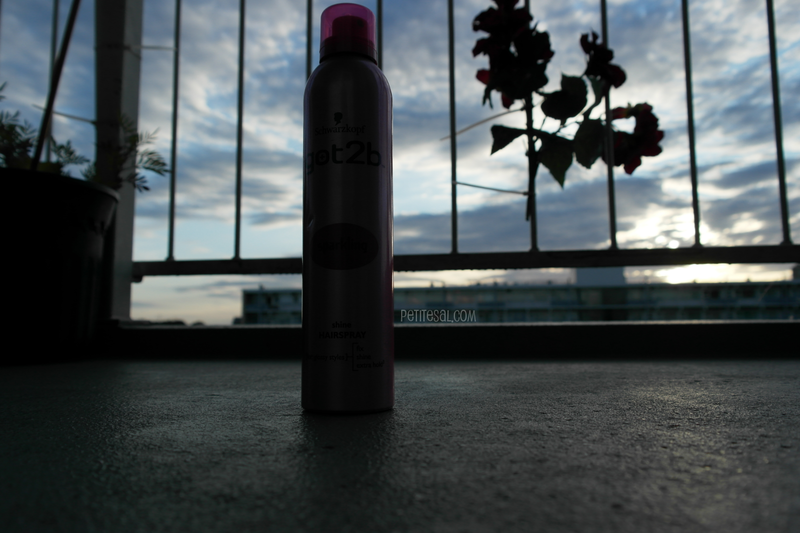 This week I'm reviewing the Schwarzkopf Got2B Shine hairspray. And I can tell you one thing: this hairspray is one that tickles your senses! Keep on reading! 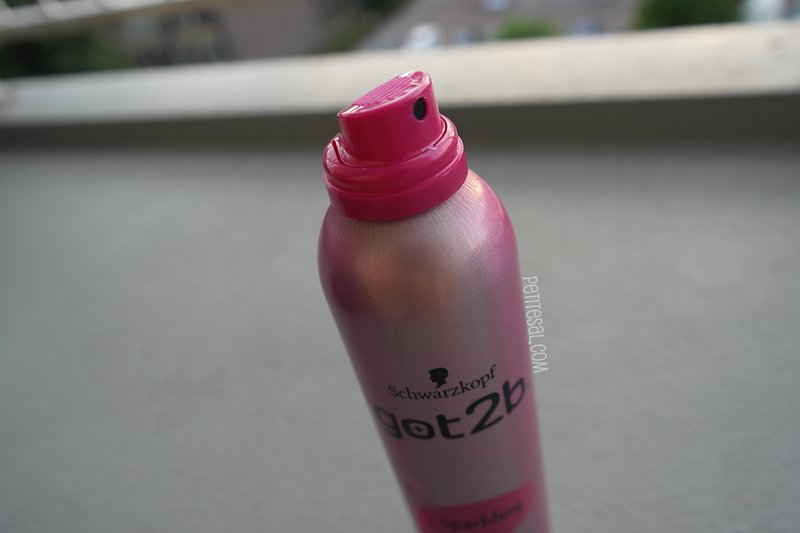 Because I'm so attached to my L'Oréal Elnett hairspray, I decided to try this hairspray from Schwarzkopf: the Got2b Sparkling shine hairspray. And I have to be honest, once I saw it in the store, I couldn't help but think: "aww.. what a sweet looking hairspray!" So this one it is! As any other hairspray, this one comes in a spray. Duh. It contains 300 ml, which is quite normal for hairspray. The spray is really easy to use and you don't need to press hard. The minimalistic packaging is pink and looks sweet and that's done with a purpose, I'm sure about that. Continue reading to know why. The hairspray gives the right amount of hold and fixation, without getting sticky. That's really important for me, because I like my hair to be bouncy and playful and there's nothing playful about sticky hair. Another big big PLUS is that you don't get those icky white flakes when you comb out your hair or when you accidentally run your fingers through your hair. I like! This hairspray has such an amazing scent. When I sprayed it for the first time I was in shock! It kind of smells like watermelon bubblegum, or more like strawberry ice cream, or maybe like a sweet perfume. I can't place it, but MAN does it smell good!! Usually I'm not into sweet scents, let alone something that smells like candy or ice cream, but this hairspray.. The smell is amazing! It's a lot better than the suffocating hairspray smell you usually have. When you're spraying it, you can still smell the alcohol, but the sweet scent through it really makes a difference. After spraying it on your hair, the scent is really subtle (a subtle perfume-ish scent) and it doesn't last on your hair (to me that's a plus). Does it give you the shine it promises? Yes! It does, actually. I had high hopes, and even though it doesn't live up to those hopes, it definitely gives a right amount of shine! I tried it on straightened hair, so I could really test if it gives my hair shine and it does. I used dry shampoo on my hair and we all know that makes the hair so dull. But after spraying with this hairspray it got shiney again! Yay! 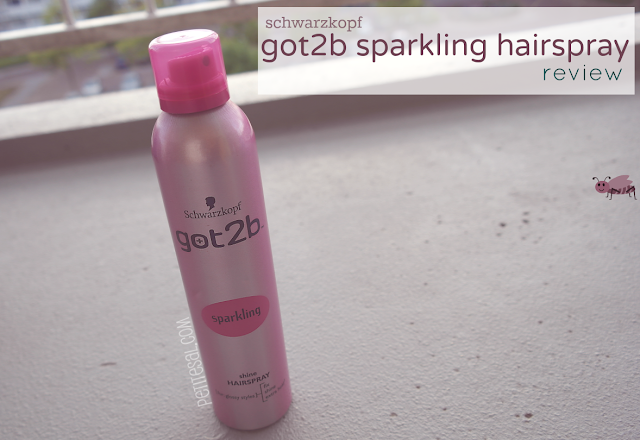 The Schwarzkopf Got2b Sparkling shine hairspray retails for €6,79. I bought mine at a local drugstore (Kruidvat). Would I repurchase this hairspray? I think I will, actually! Like I said, I'm very fond of the L'Oréal Elnett hairspray and I still am, don't get me wrong, but after using this hairspray I think I'll variate more often. The Got2b hairspray has a lovely scent and gives a beautiful shine to the hair. To be honest, it doesn't have the same hold as the Elnett hairspray, but the rest of the pros will cover up for that! What do you look for in a hairspray? And tell me which one is your favourite! I also love the L'Oreal Elnett hairspray! Yaay I'm so happy with the pictures they're stunning! Absolutely stunning! eye candy! Thank you for the handy review dear! I use hairspray daily, so I am interested in trying this one out! I hate sticky hairsprays and having my hair be unnaturally stiff. This sounds perfect! Thanks for the great review!